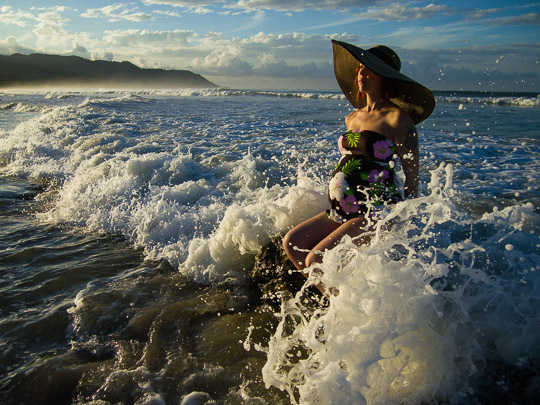 We wanted to make some interesting pregnant photos and I figured that the beautiful morning light on the beach would be the way to go. We made several frames as the sun came up, but nothing to top this shot. There had been waves lapping against the rocks she was sitting on, but nothing like the one in the photo. I saw the larger wave coming and asked my wife to look calmly toward the beach. If I had tripped the shutter a second later she would not have been wearing the serene face you see here! I love this photo because she looks like the calm center of the universe as the waves are crashing around her. I think it’s a great tribute to the strength that all mothers have.